Jack's secret admirer knows everything: where he's hanging out, who he's sleeping with, who his mum is dating. They claim they love Jack, but not his unashamedly queer lifestyle. They want him to curb his sexuality, or they'll force him. I’ve had Jack on my TBR pile for a while now. It sounded like a much-needed queer book and I knew that I would enjoy this one right from the first page. 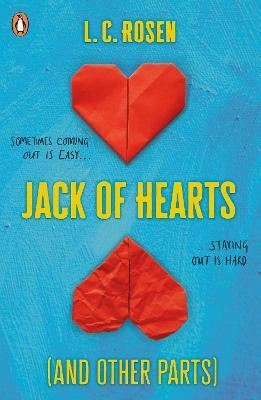 Here’s the thing - Jack of Hearts is a unique novel for me because I ABSOLUTELY LOVED the characters, (especially Jack, Ben, Jenna and Jack’s mom) their voices, Jack’s column and everybody’s fiercely inclusive and open attitudes but I HATED the mystery element to the book. I could not stress the importance of reading this book enough to ALL TEENAGERS BUT OH GOD I HATED THE MYSTERY. I hated ‘Pinky,’ and how Jack gave in to the blackmail and I HATED the conclusion to it all because WHY? WHAT WAS THE POINT? WHY? WHY? WHY? It was probably the MOST CONFUSING AND DISSATISFYING ENDING I’VE EVER REACHED IN A MYSTERY (not that I enjoyed finding out whodunnit process much either.) I’ve spoken to a lot of people who said they loved this purely because they like character-driven stories. I prefer stories that are an equal combination of plot and character, and usually, love or hate them both together. In think case, I LOVED THE CHARACTERS but HATED the mystery element of the plot. In fact, I finished this book DAYS ago and I still can’t understand THE POINT OF HAVING ALL THAT IN THE BOOK AT ALL. It was not fleshed out properly, I didn’t understand the person’s motivations at the end, I didn’t understand why Jack didn’t just TELL PEOPLE when the blackmail got bad and OH GOD WHY? I would have honestly given this book 10/5 stars if the mystery wasn’t there, but when I think about Jack of Hearts and other parts, it’s all I can see now. THIS BOOK HAD THE POTENTIAL TO BE EXCELLENT, BUT FAILED AT THE MYSTERY AND MADE IT ALL MEDIOCRE. To sum up: - BRILLIANT CHARACTERS - MUST READ FOR ALL TEENAGERS - I LOVE JACK - AND HIS MOM, JENNA AND BEN - I LOVE THE COLUMN - I HATE THE MYSTERY. BE WARNED. IT IS TERRIBLE, ESPECIALLY THE ENDING.